It looked like nothing, a quick run near midfield the two Hoffenheim defenders nearest him could barely be troubled to defend. Tyler Adams’ move started the build-up to the goal that earned RB Leipzig a 1-1 home draw. That’s just the second point from an available nine RB Leipzig has taken this calendar year at Red Bull Arena. Those results have been disappointing. Adams has not. Since arriving from New York Red Bulls in January, the United States international has been influential in ways that will benefit his club and his country for years to come. While goals are the signature highlight of soccer, the most direct impact a player can have on a game, that doesn’t mean other areas of the pitch aren’t incredibly important. 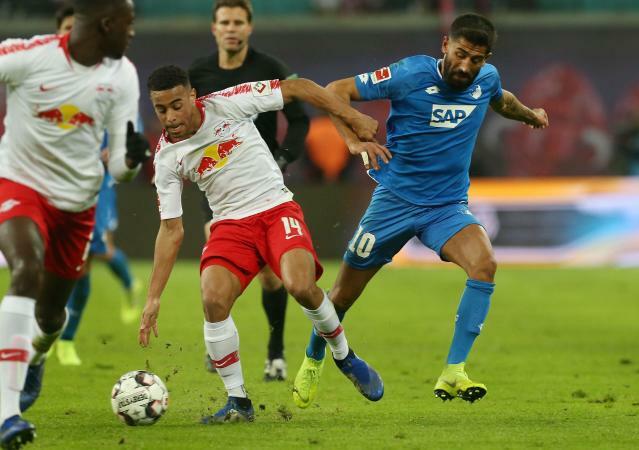 Adams patrols those areas with awareness and IQ beyond his 20 years, and pinpointing his work against Hoffenheim is hardly making a mountain out of a molehill to demonstrate it. He never lacks that confidence and he incubates scoring opportunities, which is vital for RB Leipzig. Manager Ralf Rangnick loves to throw numbers into the attack – the goal-scorer Orban is a fullback, not a forward – and he needs his defensive midfielders like Adams to be able to win the ball consistently and distribute it quickly. Here’s the ultimate vote of confidence: Down a goal at halftime on Monday, Rangnick’s first substitution was not one of the attackers he had in the matchday squad. It was the deeper-lying Adams. He knew the chance Adams stood to help orchestrate a goal was probably greater than his other substitutes’ chances of finishing one. And here’s the thing: Adams is hardly a one-position pony. Such skill and vision have plenty of U.S. men’s national team fans clamoring for Adams to take over the No. 8 mantle, or advanced midfielder, in coach Gregg Berhalter’s setups going forward. Adams has even excelled at fullback, which is where he first made his name with the Red Bulls, although based on recent form and deployment that job might be Weston McKennie’s to lose. You know, the OTHER 20-year-old Bundesliga-based defender/midfielder in the USMNT player pool. Either way, it’s a promising time for the U.S. program. This generation of Americans seems loaded with versatile young players establishing themselves in Europe’s top leagues, several of whom were homegrown right in MLS. That’s Adams in a nutshell. It might be the only thing that can contain him.